Like the celebrity 'must have' Lip Lacquer, Voila! is destined for cult status, and is sure to become a red carpet favourite coast to coast. Especially suitable for oily skin, Voila! 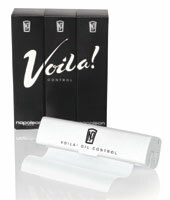 Oil Control fights shine and provides a fuss free alternative to powder. No nonsense and instantly performing, Voila! Is also easy to carry in a practical purse size pack. Featuring 7 metres of blotting paper designed to minimize shine whenever and wherever you need. So simple to use - just tear off a section, press on face and Voila! Instant shine off!